We are setting off for New Zealand today. We are stopping over at Singapore, where I used to live, for 2 nights, and flying to Auckland. After staying in Auckland for 3 nights, finally we are flying to Wellington, where Arata's Nana is waiting. I hope my cold will get better after eating lots of nice Singaporean food. (Yesterday, I had a slight temperature and terrible sore throat, and I had to miss the company's Christmas party which I had been really looking forward to......) Flight time to Singapore is longer than to Japan. It's 13 hours. From Singapore to Auckland is another 11 hours. Hopefully, Arata will be ok. Well, I will probably have more difficult time on board. My cold will not getting any better there. 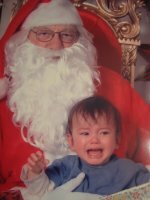 Arata met Father Christmas for the first time. He felt so scared with the long white beard. He could not stop crying. Is he going to see another Santa in summer clothes in New Zeland?